The SSC Ultimate Aero is a mid-engined sports car that was produced by SSC North America (formerly known as Shelby SuperCars) from 2006 until 2013. The SSC Ultimate Aero held the title of the fastest production car in the world, according to the Guinness World Records, from 2007 (when it was officially timed at 256.18 mph (412.28 km/h)) until the introduction of the Bugatti Veyron Super Sport in 2010. In April 2013, the Guinness World Records temporarily disqualified the Veyron's record time for a period of five days due to concerns about electronic speed limiting changing the function of the car, but after investigation reinstated the Veyron as the record holder. 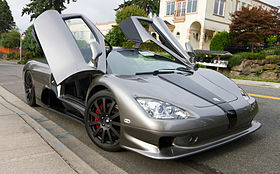 The SSC Ultimate Aero was not sold with electronic driver aids such as antilock brakes or traction control, as according to Jerod Shelby, "Early design philosophy on the car was to make it a driver's car. I wanted a car that you not only throttled with your right foot but at times you could steer with your right foot and a sensor." The first SSC Aero prototype was completed in 2004 and began road testing in anticipation of the SSC Ultimate Aero production vehicle. Horsepower - Initially 782 hp (583 kW; 793 PS) @ 6600 rpm as built in 2004. 908 hp (677 kW; 921 PS) @ 6600 rpm after 2005 upgrade. Torque - 860 N⋅m (634 lb⋅ft; 88 kg⋅m) @ 5800 rpm as built in 2004. 1,045 N⋅m (771 lb⋅ft; 107 kg⋅m) @ 5800 rpm after 2005 upgrade. Max Speed - 380 km/h (236 mph) as built in 2004. 390 km/h (242 mph) after 2005 upgrade. Wind tunnel testing indicated that the Ultimate Aero could theoretically reach a top speed of 439 km/h (273 mph) given appropriate transmission gear ratios, although the supplied transmission would result in 418 km/h (260 mph) at the car's redline. The base Aero, however, had a theoretical top speed of about 380 km/h (236 mph). The Ultimate Aero accelerates from 0–96 km/h in 2.78 seconds, slower than the Bugatti Veyron which achieves 0–96 km/h in 2.46 seconds partially due to its AWD drivetrain. Styling of the Aero includes the use of butterfly doors similar to those found on the McLaren F1 and Enzo Ferrari. Carbon fiber and titanium are used throughout the car, helping to limit the weight to 1,293 kilograms (2,851 lb) for the standard Aero. The SSC Ultimate Aero was the final version of the prototype, introduced in 2006. It had an increased engine displacement of 387.2 cu in (6,345 cc) and increased boost of 14 psi (0.97 bar). In 2009, SSC updated the Ultimate Aero TT, with the new version having an increase in power of 15% over the older model. SSC predicts a top speed of over 270 mph (430 km/h) is possible. In order to prevent the engine from overheating, airflow to the engine has been increased 20% with new carbon fiber louvers. The nose has been redesigned to make the car more aerodynamic, and the interior has been redesigned. The new Aero also has a new AeroBrake system, which is a spoiler that rises up to 8 in (203.2 mm) when the brake is pressed. This updated model reached a top speed of 257.41 mph (414.26 km/h) in a test, according to SSC. A 2009 SSC Ultimate Aero, albeit with the new prototype SSC Tuatara gearbox fitted, was able to complete six runs of 0-200 mph (322 km/h) in under 16 seconds, (15.1s - 15.8s) according to SSC's gear ratio testing results. In 2009, SSC announced that they would be commencing production of the Ultimate Aero EV, an electrically-powered version of the Ultimate Aero. This car featured twin electric motors, claimed to be capable of producing 1,000 hp (746 kW; 1,014 PS), and 800 lb⋅ft (1,085 N⋅m; 111 kg⋅m) of torque, which was transmitted through a three-speed automatic transmission. SSC claimed that the car would be able to accelerate from 0–60 mph (0–97 km/h) in 2.5 seconds, and reach a top speed of 208 mph (335 km/h). However, the car never entered production. In 2013, SSC introduced the Ultimate Aero XT, which was a special version of the Ultimate Aero that was built to celebrate the end of its production. Only five XTs were built, and they utilized some components that were designed for its Tuatara replacement; for example, the Ultimate Aero XT was fitted with SSC's new 6.9 liter all-aluminum twin-turbo V8 engine and a seven-speed paddle-shifted gearbox. Simulation and testing at NASA's Virginia facility had shown the Ultimate Aero TT theoretically capable of attaining approximately 273 mph (439 km/h), sufficient to surpass the production car record-holding Bugatti Veyron's 253.81 mph (408.47 km/h). A 12-mile (19 km) stretch of U.S. Route 93 in Nevada was closed on March 21, 2007 to allow SSC to test the Ultimate Aero TT, but the attempt was called off due to bad weather, and an effort the following day failed due to sub-optimal conditions, with test driver Rick Doria reporting wheel-spin at speeds above 190 mph (306 km/h). Six months later SSC announced they had established a new production car speed record of 256.14 mph (412.21 km/h) in West Richland, WA on September 13, 2007. In accordance with FIA Speed Records rules it was an average of two runs in opposite directions, 257.41 mph (414.26 km/h) and 254.86 mph (410.16 km/h). The results were verified by the Guinness World Records on October 9, 2007. SSC is currently one of only 26 automobile manufacturers in history to have held the record. SSC also applied to Guinness for the world record for the highest power for an emissions-legal production automobile. Its record was broken on July 4, 2010 by the Bugatti Veyron Super Sport, which reached a certified top speed of 431.00 km/h (267.81 mph). ^ a b c "SSC Ultimate Aero". Archived from the original on 2012-01-03. Retrieved 2012-02-17. ^ Weiss, C.C. (2013-04-16). "And the world's fastest car is ... the Bugatti Veyron Super Sport (again)". Gizmag. Retrieved 2014-12-11. ^ a b "2004 SSC Aero SC/8T Specifications". Ultimatecarpage.com. Retrieved 2014-12-11. ^ a b Spinelli, Mike (2005-06-14). "Supercar for the Big-and-Tall Set: The SSC Aero SC/8T". Jalopnik. Retrieved 2014-12-11. ^ a b c d e f g h i j k "Shelby Supercars' old specification". Archived from the original on 2006-02-08. ^ "Shelby Supercars' old homepage". Archived from the original on 2006-02-08. ^ "Autocar Magazine: Bugatti Veyron Road Test". ^ "SSC Ultimate Aero TT Supercar Up For Bids On eBay". Archived from the original on 2008-02-07. Retrieved 2007-12-31. ^ a b c d e f g Simona (2006-08-20). "2007 SSC Ultimate Aero TT". Top Speed. Retrieved 2014-12-12. ^ "Three Changes Announced for the Ultimate Aero in 2008". Archived from the original on 2008-07-05. ^ Phillips, Drew (2008-12-16). "Updated SSC Ultimate Aero boasts 104 hp (78 kW; 105 PS) over the old 2007 model, claimed top speed of 267 mph (430 km/h)". Autoblog.com. Retrieved 2010-10-11. ^ a b c d e f g h "SSC Ultimate Aero". SSC North America. Archived from the original on 2014-12-05. Retrieved 2014-12-12. ^ "Home of the Tuatara & Ultimate Aero". SSC North America. 2007-09-13. Archived from the original on 2012-03-01. Retrieved 2012-05-29. ^ a b "2009 SSC Ultimate Aero EV Specifications". Ultimatecarpage.com. 2009-01-26. Retrieved 2014-12-12. ^ Vijayenthiran, Viknesh (2012-08-03). "SSC Sending Out Ultimate Aero With Tuatara-Powered XT". Motor Authority. Retrieved 2014-12-12. ^ a b c d e f g "SSC Announces Limited Production of Five Ultimate Aero XT's". SSC North America. 2012-08-12. Archived from the original on 2012-08-06. Retrieved 2014-12-12. ^ "SSC confident Ultimate Aero TT will be will be world's fastest soon - Autoblog". Archived from the original on 2007-03-28. Retrieved 2007-12-31. ^ "It's Official: SSC's Ultimate Aero Speed Record is Validated by Guinness World Records" (PDF) (Press release). Shelby SuperCars. October 9, 2007. Archived from the original (PDF) on January 3, 2010. Retrieved March 8, 2010. ^ Abuelsamid, Sam (2010-04-07). "Bugatti Veyron 16.4 Super Sport sets land speed record at 267.81 mph (431.00 km/h)! — Autoblog". Autoblog.com. Retrieved 2010-07-19. Wikimedia Commons has media related to SSC Aero. This page was last edited on 26 March 2019, at 20:26 (UTC).